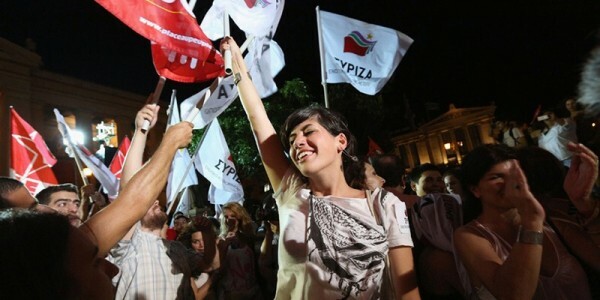 SYRIZA is calling for a 'true democracy' that simultaneously gives rise to an image or a dream of how a polity could look once the State withers away. In an interview that Alexis Tsipras gave to the journalist Stavros Theodorakis in June 2012, we hear Tsipras explaining SYRIZA’s manifesto and saying: ‘We are not with the State, We are with the Community’.2 I had to pause and replay this over and over. I was startled by the distinction Tsipras had made between the State and the Community. I am writing this not as an expert in Greek politics but as somebody touched by the SYRIZA-led shift in socio-political discourse and actions that we have witnessed over the past week: (a) the suspension of the privatization of the Greek ports of Piraeus and Thessaloniki (b) the suspension of plans to sell the public power stations (c) the restoration of a 751 Euro a month minimum wage (d) the granting of Greek citizenship to migrant children born and raised in Greece (e) the rehiring of 300 cleaning women at the ministry of finance who had been sacked as part of the austerity cuts (f) the refusal to recognize the Troika as a political entity with which to renegotiate the austerity measures (instead ‘it would now deal separately as a sovereign government with its constituent parts: the EU, the European Central Bank (ECB) and the International Monetary Fund (IMF)).4 After six years of debilitating austerity measures that weakened the Greek people materially, socially and morally, this newly elected government has taken immediate action to dispel the fear, terror and destruction that the Troika has imposed through neoliberal economic policies and bureaucratic imperialism. Alexis Tsipras told Theodorakis in June 2012 that SYRIZA is for the community and not the State. In doing so, he dismantled the myth, the political myth that has the State uncritically identified with the people. This is a myth that is common amongst contractarian political theorists such as Hobbes, where the Leviathan — the figure of a political entity, a polity — incorporates the people. Instead here, Tsipras, through a perfomative utterance, not only dismantles the myth but simultaneously makes the community, koinonia, into the essence of government. The people or community is no longer identical to the State. Those well-versed in Marxist perspectives, unlike myself, may say: what we hear in Tsipras is a variation of Marx’s critique of Hegel in The Critique of Hegel’s Theory of the State (1849; 1975). Collin Hay in his essay ‘Marxism and the State’ (1999) informs us of Marx’s disagreement with Hegel’s idealism of the State.7 Hegel saw in the entity of the State the possibility of it and civil society being united, the universal and the particular coming together.8 While Marx understood Hegel’s desire to find in State structures a resolution of the particular and the universal or as Hay puts it, an ‘ideal collective citizen capable of expressing the general and communal interests of all its subjects’,9 he could not see how ‘true democracy’ (human emancipation) as opposed to political democracy could function through the State as long as it had a vested interest in protecting property rights.10 We can thus see a connection between Tsipras’s performative utterance (‘We are are not with the State, We are with the Community (koinonia)’ ) and his Marxist background. It is obvious that when he calls into being the community or koinonia as the driving force behind their (SYRIZA’s) political actions and the bedrock of the polity, he is directing us towards a notion of ‘true democracy’, one where citizens, people and communities are freed from the State structures that have kept them demoralised, enslaved and obedient to the very same State structures that had hitherto served the exclusive interests of Greek elites and their global counterparts. He is indeed calling for a ‘true democracy’, but I think this calling, this performative speech act that we hear in this interview (and I think this is the important part) has simultaneously brought into being an image of how a polity will look — an image or a dream — once the State withers away. He has drawn the contours, the image of a polity where what is common to all — natural/cultural resources, putting each other first, putting people first, etc. — will be the bedrock of the coming polity. I think it is the image, the dream of an order where the common is at its centre, that may have enabled the election of a left-platform government in Greece for the first time. But this happened because SYRIZA contoured a dream or an image, or to use Sorel’s language — a myth, after hearing the voices of the communities that they have been elected to represent. It is the dream of a European Community where people, migrants, and natives, come together to build a polity where obstinate structures (obedient recognition to certain undemocratic and unchecked institutions like the Troika, the priority of financial accounting as well as banking profitability) wither into insignificance. enough to hug our Earth once I reckon! enough to hug our Earth twice I reckon! While watching this new polity unfolding, a polity that I used to dream about, I played this poem/song over and over, hoping that this time we would extend our hands to embrace what is common to all, old and young, nuanced by our differences yet ready to embrace them again, ready to embrace the earth again. I know it’s just a dream, but then as Poe reminds us, isn’t it all a dream within a dream? Elena Loizidou is a Reader in Law and Political Theory at the School of Law, Birkbeck, University of London. I read this article and found it very interesting, thought it might be something for you. The article is called ‘We are not with the State, We are with the Community’ and is located at http://criticallegalthinking.com/2015/02/02/not-state-community/. This was a great read, Elena. Very nicely done!